Welcome to another Color Challenge from The Play Date Cafe! This weeks colors are Light Blue, Bright Blue and Cream/White. Such a beautiful color combination! The colors I used are Stampin' Up! Brilliant Blue, Bashful Blue,Watercolor paper and Black as a Neutral. 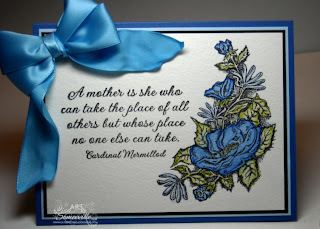 The beautiful floral spray and sentiment are from Our Daily Bread Designs new April Release called "Mom". I stamped the floral spray in Black Archival on Watercolor paper. The image was colored using the Marker Watercoloring Technique. I added the sentimentiment in Black Archival using a Stamp-a-ma-jig for proper placement. I tied a double bow with Light Blue Satin Ribbon using the Bow Easy. Here's this weeks inspiration piece, we'd love to have you play along. See The Play Date Cafe Blog for full details on how to enter this weeks challenge. Looking for more inspiration, be sure to click on the PDCC Logo on my sidebar to visit the other Designers blogs. Also, be sure to stop by and visit Arielle Gordon, this weeks PDCC Guest Designer. Just a lovely card and that bow is the focal for sure! What a lovely mother's day card. Lovely coloring on your flowers and beautiful design! Gorgeous card! You colored that image beautifully & that big blue satin bow is stunning! Great sample showcasing this week's colors! Your card is so pretty, I love those blues and that box is luxurious looking! 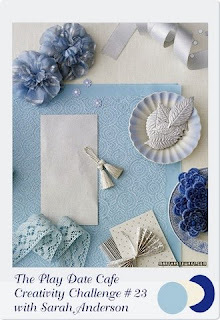 The card is just perfect for the inspiration, love those colors. Oh, blues I can definitely do!!! Love it! Gorgeous card, Lisa! Such a lovely sentiment and image and the double bow is fabulous! what beautiful colouring Lisa, such a pretty card! Bows are my fav right now--beautiful bow:) Love love love this mother's day card--great job at this color combo!! I am envious of your 'bow making' skills---mine never turn out like that! Beautiful card and I love the sentiment. Thank you for sharing. I love your card it is a beautiful design!